This article is about the English newspaper. For the Tamil newspaper, see The Hindu (Tamil). For the film, see The Hindu (film). For other uses, see Hindu (disambiguation). The newspaper and other publications in The Hindu Group are owned by a family-held company, Kasturi and Sons Ltd. 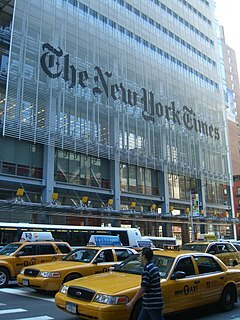 The newspaper employed over 1,600 workers and annual turnover reached almost $200 million  according to data from 2010. Most of the revenue comes from advertising and subscription. The Hindu became, in 1995, the first Indian newspaper to offer an online edition. Vijayawada is a city in the Andhra Pradesh Capital Region, on the banks of River Krishna in Krishna district of the Indian state of Andhra Pradesh. The city is the third most densely populated in the urban population of built-up areas in the world and is the second largest city in Andhra Pradesh by population. Vijayawada is classified as a Y-grade city as per the Sixth Central Pay Commission. Vijayawada is the commercial headquarters of Andhra Pradesh. It was recognised as a "Global City of the Future" by McKinsey Quarterly, which expected an increase to GDP of $17 billion by 2025. Vijayawada was ISO 37120 Platinum Level certified in October 2018 and has been added to the "Global Cities Registry". Ganapathy Dikshitar Subramania Iyer was a leading Indian journalist, social reformer and freedom fighter who founded 'The Hindu' newspaper on 20 September 1878. He was proprietor, editor and managing director of The Hindu from 20 September 1878 to October 1898. Tanjore District was one of the districts in the eastwhile Madras Presidency of British India. It covered the area of the present-day districts of Thanjavur, Tiruvarur and Nagapattinam and the Aranthangi taluk of Pudukkottai District in Tamil Nadu. Apart from being a bedrock of Hindu orthodoxy, Tanjore was a centre of Chola cultural heritage and one of the richest and most prosperous districts in Madras Presidency. Mylapore is a neighborhood in the central part of the city of Chennai, India. It is one of the oldest residential parts of the city. It is also called Thirumayilai. The locality is known for its being the birthplace of the celebrated Tamil philosopher Valluvar. 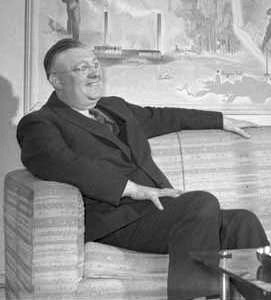 Roy Herbert Thomson, 1st Baron Thomson of Fleet, GBE was a Canadian newspaper proprietor who became one of the moguls of Fleet Street. On 21 October 2013, changes have been made in Editorial as well as business of The Hindu  N.Ravi has taken over as Editor-in-chief of The Hindu and Malini Parthasarathy as Editor of The Hindu. In a consequence, Siddarth Varadarajan has submitted his resignation. N. Ram has become Chairman of Kasturi & Sons Limited and Publisher of The Hindu and Group publications; and N. Murali, Co-Chairman of the company. Swadesamitran was a Tamil language newspaper that was published from the then Madras city from 1882 to 1985. One of the earliest Tamil newspapers and the longest in print, Swadesamitran was founded by Indian nationalist G. Subramania Iyer four years after he had started The Hindu. The newspaper was sold to A. Rangaswami Iyengar of the Kasturi family in 1915 and the newspaper remained with them until its liquidation in 1985. Narasimhan Ram also known as N. Ram is an Indian journalist and prominent member of the Kasturi family that controls The Hindu Group of publications. Ram was the Managing-Director of The Hindu since 1977 and its Editor-in-Chief since 27 June 2003 until 18 January 2012. Ram also headed the other publications of The Hindu Group such as Frontline, The Hindu Business Line and Sportstar, and has been awarded the Padma Bhushan by the Government of India and Sri Lanka Ratna by the Government of Sri Lanka. Sudharma is the only daily newspaper published in Sanskrit. The paper is published from the city of Mysore in the Indian state of Karnataka. Established in the year 1970, the circulation of the paper is mainly through post, a method that its founder resorted to when news vendors refused to stock his paper. The Stenographers' Guild, founded in 1937, is a non-profit organization providing vocational education and training in the area of Secretarial skills, Information Technology and Shorthand. It is located in T. Nagar, Chennai in the Indian state of Tamil Nadu. Kasturi Srinivasan was an Indian journalist and businessman. He was the eldest son of S. Kasturi Ranga Iyengar. Mudumbai Veeraraghavachariar (1857-1906) was an Indian journalist, freedom-fighter and teacher from the erstwhile Madras Presidency. He was one of the founders of The Hindu newspaper and served as its Managing Director from 1878 to 1905. S. Kasturi Ranga Iyengar was an Indian lawyer, Indian independence activist, politician and journalist who served as the managing director of The Hindu from 1 April 1905 till his death in December 1923. Sri Krishna Sweets is a popular Indian sweet manufacturer and eatery based in Coimbatore, Tamil Nadu. It is most noted for its Mysorepak. Gopalan Kasturi was an Indian journalist who served as the Editor of The Hindu from 1965 to 1991. Till date, he is the longest serving editor of the newspaper. Gopalan Narasimhan was an Indian journalist and entrepreneur who served as the Managing Director of The Hindu from 1959 until his death in 1977. He is the father of the former Editor-in-Chief N. Ram. Narasimhan Ravi is an Indian journalist and the current Director of Kasturi & Sons Ltd. He was Editor-in-Chief of The Hindu. He served as the Editor-in-chief of The Hindu from 1991 to 2003 and then again took over the position in October 2013. chairman of PTI. Soundararaja Iyengar Parthasarathy was an Indian journalist who served as editor-in-chief of The Hindu from 1959 to 1965. Chennai, with historically rich records dating from the British era, houses 2,467 heritage buildings within its metropolitan area (CMA), the highest within any Metropolitan Area limit in India. Most of these buildings are around 200 years old and older. Some of them are Chennai Central, Chennai Egmore, Ripon Building, Bharat Insurance Building, and so forth. Chennai is home to the second largest collection of heritage buildings in the country, after Kolkata. The official list of heritage buildings was compiled by the Justice E. Padmanabhan committee. Narasimhan Murali, Born in Chennai (Madras) on 11 August 1946. Did his school education in Madras Christian College High School, graduated in Commerce from Loyola College, Chennai and later professionally qualified as a Chartered Accountant. Joined the family business of THE HINDU in 1969. Became General Manager in 1977 and Joint Managing Director in 1995. In 2006 became Managing Director of THE HINDU and M/s.Kasturi & Sons Limited. Presently Co-Chairman, Kasturi & Sons Ltd., Proprietors of THE HINDU group of publications. Malini Parthasarathy is an Indian journalist, who was formerly editor of The Hindu and is currently the co-chairperson of The Hindu Group's Publishing Company, THG Publishing Private Limited, formed from the de-merger of Kasturi & Sons Limited's publishing business. Parthasarathy replaced N. Ravi for the position of editor. She resigned from the post on 5 January 2016. B. Rajam Iyer was a Carnatic singer from South India. He was awarded the Madras Music Academy's Sangeetha Kalanidhi in 1987. 1 2 "Submission of circulation figures for the audit period Jan – Jun 2017" (PDF). Audit Bureau of Circulations . Retrieved 5 January 2016. ↑ "About Us News". The Hindu. Retrieved 2018-05-15. ↑ Drèze, Jean; Sen, Amartya (1991-02-21). The Political Economy of Hunger: Volume 1: Entitlement and Well-being. Clarendon Press. ISBN 9780191544460. ↑ Bald, Vivek; Chatterji, Miabi; Reddy, Sujani; Vimalassery, Manu (2013-07-22). The Sun Never Sets: South Asian Migrants in an Age of U.S. Power. NYU Press. ISBN 978-0814786437. ↑ "Kasturi & Sons Limited Company Profile - EMIS" . Retrieved 14 May 2016. ↑ "Expanding footprint". The Hindu. 2018-02-27. ↑ Ramnath, M.S. ; Jayshankar, Mitu (22 April 2010). "The Hindu board room becomes a battlefield". Forbes India. Retrieved 4 March 2014. ↑ "Vizhippunarvu - Kuthusigurusami - Kuruvikarambaivelu - Periyar - Kudiarasu" . Retrieved 14 May 2016. ↑ S. Muthiah (13 September 2003). "Willing to strike and not reluctant to wound". Archived from the original on 29 September 2005. Retrieved 25 April 2006. ↑ "Navigation News - Frontline" . Retrieved 14 May 2016. ↑ Worldpress.org, the directory of online Indian newspapers and magazines lists The Hindu as "Left-leaning, independent", and its biweekly sister publication Frontline as "Independent biweekly". ↑ Venkatachari Jagannathan (1 June 2003). "Change of guard" . Retrieved 20 April 2006. ↑ "Opinion – Letters to the Editor". 3 September 2003. Retrieved 20 April 2006. ↑ "Opinion – Letters to the Editor". 23 September 2003. Retrieved 20 April 2006. ↑ "The Hindu". The Hindu. 27 August 2003. Archived from the original on 10 March 2007. Retrieved 20 April 2006. ↑ "1989: Scandal in India". centennial.journalism.columbia.edu. Retrieved 2018-01-24. 1 2 3 "Developing a paper for a new reader". The Hindu. 13 September 2003. Archived from the original on 24 November 2004. Retrieved 20 April 2006. ↑ "The Hindu: Very Divided Family". www.outlookindia.com. Retrieved 2018-01-24. ↑ Onkar Singh (8 November 2003). "Journalists protest TN assembly's arrest of scribes" . Retrieved 20 April 2006. ↑ Murali, N (2011-09-01). "N Murali: Double standards on display at Hindu". 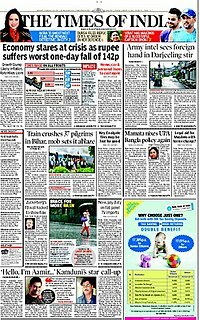 Times of India . Retrieved 2017-07-22. ↑ Thomas, Liffy (2 April 2012). "The Hindu goes to school". The Hindu. Chennai, India. ↑ S. Bridget Leena. "'The Hindu' to launch Tamil newspaper on 16 September". livemint.com/. Retrieved 14 May 2016. 1 2 "Changes at the Helm: Editorial and Business". The Hindu. Chennai, India. 21 October 2013. ↑ "Chennai floods: The Hindu not published for first time since 1878". BBC News. 2 December 2015. Retrieved 2 December 2015. 1 2 Rohan Venkataramakrishnan. "Malini Parthasarathy steps down as editor of the Hindu, saying she has been 'harshly judged'". Scroll.in. Retrieved 14 May 2016. 1 2 3 "Resignation of Editor & interim arrangements in place". The Hindu. 2016-01-05. Retrieved 14 May 2016. ↑ "The Hindu returns to Africa". The Hindu. Chennai, India. 22 August 2012. Retrieved 22 October 2012. ↑ Shukla, Archna (25 March 2010). "Battle for control breaks out in The Hindu very divided family". The Indian Express. Retrieved 25 March 2010. ↑ "N. Ram to step down as editor-in-chief of The Hindu" . Retrieved 19 January 2012. ↑ "Siddharth on Twitter". Twitter. Retrieved 14 May 2016. ↑ "Malini Parthasarathy is the Editor of The Hindu". The Hindu. 2015-01-20. Retrieved 14 May 2016. 1 2 "Mukund Padmanabhan is Editor of The Hindu; Raghavan Srinivasan becomes Business Line Editor". The Hindu. 2016-03-23. Retrieved 14 May 2016. ↑ Khuraniya, Naina; Maniar, Avani (2016-06-03). A Study on the Usage of Internet by Working Women of Vadodara City for Performing Their Household Responsibilities. Anchor Academic Publishing. ISBN 9783960675518. ↑ "Our new website goes fully live on 29 June". The Hindu. Chennai, India. 23 June 2010. Retrieved 26 June 2010. ↑ "Newspapers of the World: VI - The Hindu". The Times (56260). 3 March 1965. p. 11. ↑ Lahiri, Tripthi (2011-04-26). "A Family Feud at the Venerable Hindu". Wall Street Journal . Retrieved 2014-02-02. ↑ Chowdhury, Chandrahas (2012-02-01). "India's Top Newspapers Battle for Readers' Hearts and Souls". Bloomberg . Retrieved 2014-02-02. N. Ram (13 September 2003). "Yesterday, Today, Tomorrow". The Hindu. Archived from the original on 19 February 2007. Retrieved 20 April 2006. Looking Back: The history of The Hindu as told by historian S. Muthiah. "Willing to strike and not reluctant to wound". 13 September 2003. Archived from the original on 29 September 2005. Retrieved 28 April 2006. "Making news the family business". 13 September 2003. Archived from the original on 10 March 2007. Retrieved 28 April 2006. "A clarion call against the Raj". 13 September 2003. Archived from the original on 12 January 2009. Retrieved 28 April 2006. "Treading softly – but modernizing apace". 13 September 2003. Archived from the original on 15 October 2007. Retrieved 28 April 2006. "Developing a paper for the new reader". 13 September 2003. Archived from the original on 10 March 2007. Retrieved 28 April 2006. N. Murali (13 September 2003). "Core values and high quality standards". The Hindu. Archived from the original on 27 November 2007. Retrieved 20 April 2006. Wikimedia Commons has media related to The Hindu .